These Knipex 7201160 diagonal cutters are constructed from chrome vanadium solid style forged top quality steel with precision non-slip tips for added strength and durability. With high quality material and precise workmanship, these pliers give long service. The cutting edge tips provide a clean cut in soft materials - eg. thin copper wires. The narrow head style is ideal for use in confined areas. 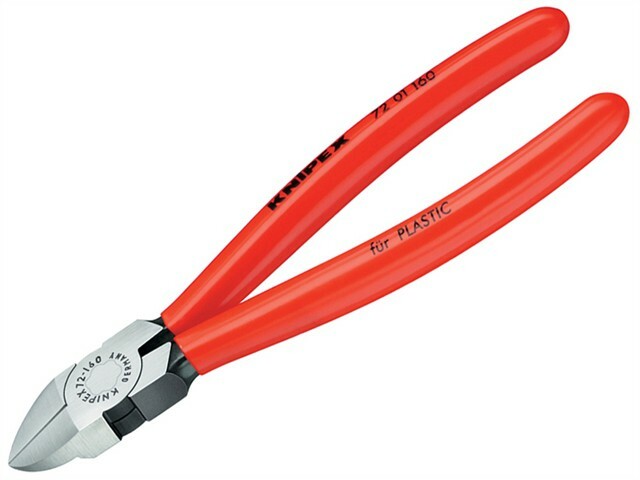 Like most of the Knipex range of pliers, all components have oil hardened edges, vanadium electric steel hardened forged to approximately 62 HRc. They are ideal for cutting soft wire close to a flat surface with the bevelled blade. The cutters have polished heads and plastic PVC dipped coated handles for added durability and comfort. Knipex 7201160 diagonal cutters are ideal for all trade or DIY applications and especially the electrical trade. These Knipex diagonal cutters are 160mm in length and are ideal for plastics and lead applications as they are flush cutting. High quality material and precise workmanship guarantee long service life. Length: 160mm (6 1/4 in).